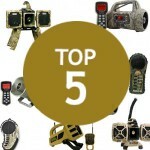 The Primos Alpha Dogg is a deluxe, feature-rich electronic call which is definitely a step above the Primos Dogg Catcher (click to see our review). It's more expensive with its approximate $200 price tag - but it's definitely worth it. Read on to learn why the Primos Alpha Dogg is a great choice for you. There's no shortage of praise for the historic Primos brand on our site here, and for good reason. Some of the guys behind Primos, like Will Primos, have been building calls since the 1960s. For this reason, we include Primos in the top tier of predator call companies. The Primos brand has definitely earned its storied reputation in the hunting world. 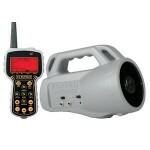 The Primos Alpha Dogg is an all-in-one, never-need-another-electronic-call kind of unit. At the time of writing, the Primos Alpha Dogg is in the $2xx range on Amazon, which is consistent with the best non-entry level predator calls on the market. This unit is constructed with the durable, high quality composite moulding material that Primos built their brand on. Because of this, it's a great electronic caller for even the worst weather conditions. Furthermore, the Primos Alpha Dogg is a great choice for the predator hunter who is less price-sensitive. In this unit, you'll get versatile hunting call sequencing from Randy Anderson, booming non-distortion speakers, and 180-degree rotation. The Alpha Dogg is a large step up from Primos' entry level Dogg Catcher. Not only does the Alpha Dogg come programmed with 3x more calls, but it also features expert hunt sequences by Randy Anderson. This is a hugely important feature because it takes some of the guess-work out of what call to use, and when. Some hunters might be turned off by this - enthusiasts might argue that using sequences is one of the most rewarding aspects of coyote calling. However, if you don't care about sequencing your own calls, the Primos Alpha Dogg will do an excellent job on your behalf. It's got some killer 30-minute pre-programmed sequences that come stock with the unit. Why Buy the Primos Alpha Dogg? 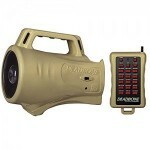 The Primos Alpha Dogg is Primos' mid-level electronic predator call. This unit comes pre-programmed with 75 different predator calls. It also includes 6 30-minute call sequences prepared by some of the foremost experts in coyote hunting. The Alpha Dogg also comes with 2 GB of memory, enough to store up to 1,000 of your favorite sounds. If you buy this unit, you won't need another electronic call. The Alpha Dogg truly takes the guess-work out of coyote hunting. The Alpha Dogg is powered by dual 25-watt distortion-free speaker amps, ensuring the highest quality, crispest, and clearest calling at awesome range. Not only that, but the speakers offer full 180-degree rotation for either directional or wide-angle calling. We tested this call in an open field with 15 mph winds and had no problems hearing the call 200 yards away on the lower volume settings. Covered with Realtree MAX-1 Camo, coyotes won't see the Primos Alpha Dogg until it's too late! We love that this unit has built-in legs to stand the call up. These legs smartly fold to protect the side speakers when being carried, another clever touch by the team at Primos. When folded up, the Alpha Dogg is small enough to fit in a backpack and light enough to carry by hand. This unit's remote control has a declared range of 200 yards, but we found that to be rather under-stated. Not only that, but the remote has a 2.5" full-color LCD screen. We were impressed by the menu layout - we found it to be super user-friendly and easy to navigate. Finally, the remote has a "night mode" and is fully dimmable if you need to adjust the light. 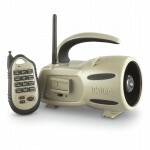 The Primos Alpha Dogg is built intelligently and has proven durability. Compared to the entry-level Dogg Catcher, the Alpha Dogg has a lot of next-level features, including great portability, call sequences, 2 GB of storage, omni-directionality, and full programmability. 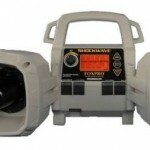 Although its price range is around the $200 mark, this unit is a great buy and its remote works from more than 200 yards away. Coming stock-loaded with 75 different calls, 6 sequences, and dual 25W amps, this e-caller will give you many years of successful hunts.